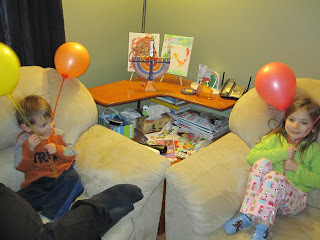 We pulled out the menorah that Alexandria and I painted at The Art Studios last year. We made some paper candles and the kids decorated them today. 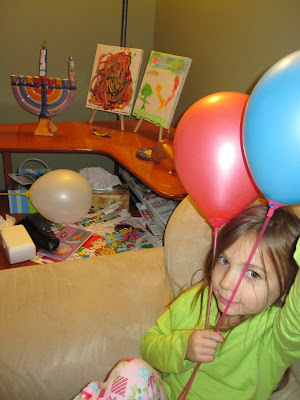 Tonight we talked about Chanukah, the menorah, The Festival of Lights and what it all means. We talked about how Alexander the Great was a friend to the Jews, but the dude after him, Antiochus, was definitely not. We talked about Judah the Maccabee, the temple and the significance of the eight candles on the menorah. I came up with a pretty good off-the-top-of-my-head Junior Kindergarten analogy for the Jews being forced to give up their beliefs, I think. So, we "lit" the shamash (middle candle of the menorah) and the first candle. Ok.. we taped the paper candles on. Then the kids got their first little Chanukah present. Alexandria got a balloon pump and Zachary got a balloon kit - both from the dollar store. So, of course the pump didn't work. I blew up the balloons and I STILL feel sick. Note to self: Never, ever buy anything from the dollar store that may require going anywhere near my mouth again! Tonight, though, I found this one. Sesame Street explains Chanukah. I'll show them this one tomorrow.